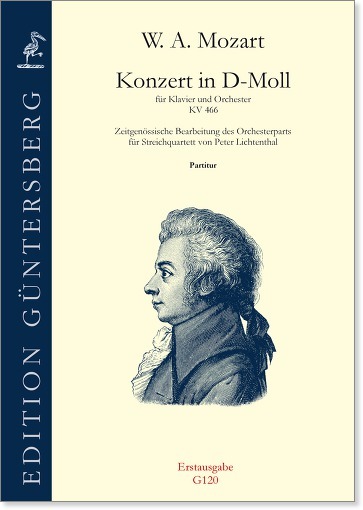 In his version of Mozart’s Piano Concerto K. 466, presented here in a first edition, Lichtenthal arranged the orchestral parts for string quartet, while the piano part remained unchanged. Therefore this concerto now becomes accessible also for all those piano players who have no opportunity to play with an orchestra. No cadenzas by Mozart have been preserved for this concerto, but along with the set of parts in Milan, a further manuscript in Lichtenthal’s hand has survived, which contains a cadenza by Johann Nepomuk Hummel for the third movement. Our playing score includes this and two further cadenzas by Hummel for this concerto. 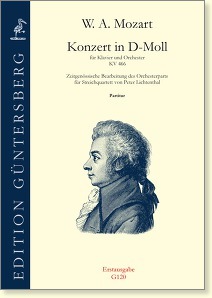 Our edition was established by the Viennese musicologist Marc Strümper. G120 page 54 measure 63: piano part is missing. Please find the corrected page here.